Looking for a trip that get all your senses excited then look no further than our Glacier National Parks Hiking Tour. Feel the trail below your feet each day as we lace up our boots for daily hikes. Smell the wildflowers and taste some of the berries along the trails. Hear the glaciers calving and the waterfalls roaring as you take in the scenery that stretches farther than you can see. 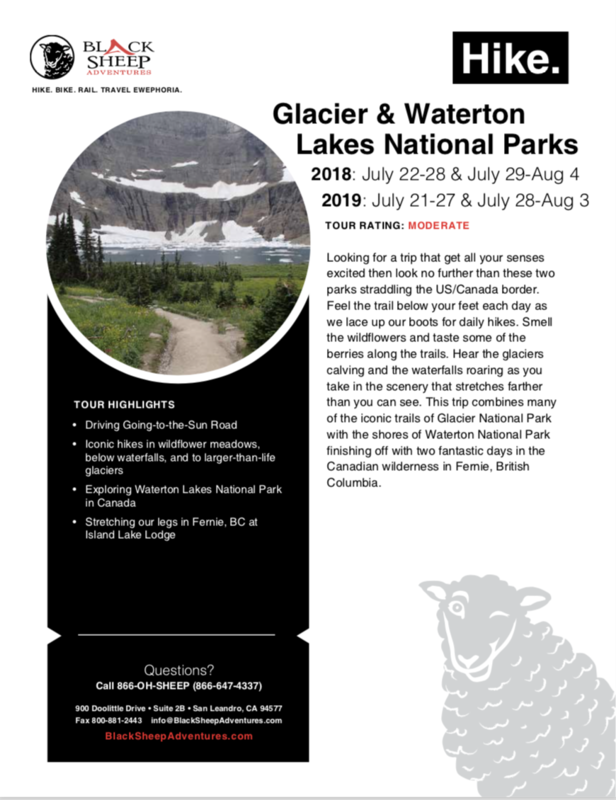 This trip combines many of the iconic trails of Glacier National Park with the shores of Waterton National Park finishing off with two fantastic days in the Canadian wilderness in Fernie, British Columbia. Sitting on the banks of Divide Creek on the Eastern border of Glacier National Park the lodge offers sweeping views of the park. The lodge’s location between Two Medicine and Many Glacier at the end of the Going-to-the-Sun Road makes it ideal for our exploration of the park. A short walk to the shores of Waterton Lake this lodge offers cozy rooms and suites featuring local artwork and mountain or valley views. After a few days of exploring the region relax at the indoor pool and whirlpool or stretch out your muscles at the fitness center. Featured in National Geographic Traveler Magazine, this picturesque lodge sits in the mountains above the town of Fernie. With trails right from your room this lodge is the perfect base to explore the Canadian Rockies. A scenic drive across the Canadian border awaits us this morning as we may our way to Waterton Lakes National Park. After lunch in town we will have multiple hiking options available along the Red Rock and Akamina Parkways to get a closer look at all this park has to offer. This evening we will enjoy a scenic dinner along the shores of Waterton Lake. Choose your trip length, lodging, dates, and more.